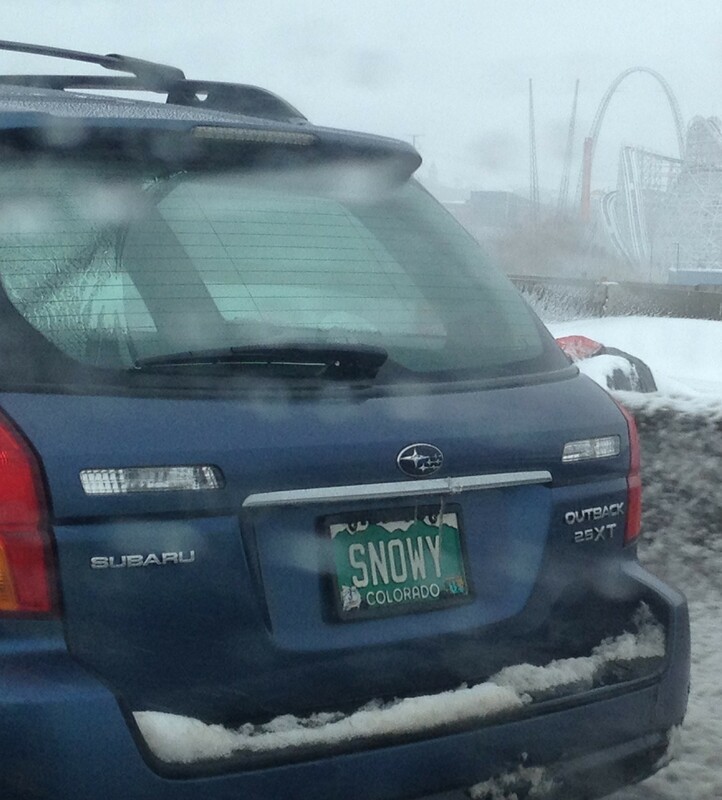 This weekend was full of great snow 🙂 This license plate says it all! Joe and I spent Saturday riding at Breckenridge. I was a bad blogger and didn’t take any pictures. But, it was a really great day. They had a couple inches of new snow and we had so much fun! It started snowing again around noon and basically didn’t stop until a couple hours ago. We decided to go to A-basin on Sunday- this was the biggest snow storm we’ve had since moving here and we could not wait to get in on the action. We got up super early to get out on the road with the other snow crazy people. Then it was time to hit the road for the slow drive home. We were exhausted and spent the rest of the night watching house hunters on the couch. And, refueling with veggie burgers, sweet potato, and asparagus, of course! Can’t wait for next weekend…is it really only Monday?!?!?! What did you do this weekend? Is there snow where you are? 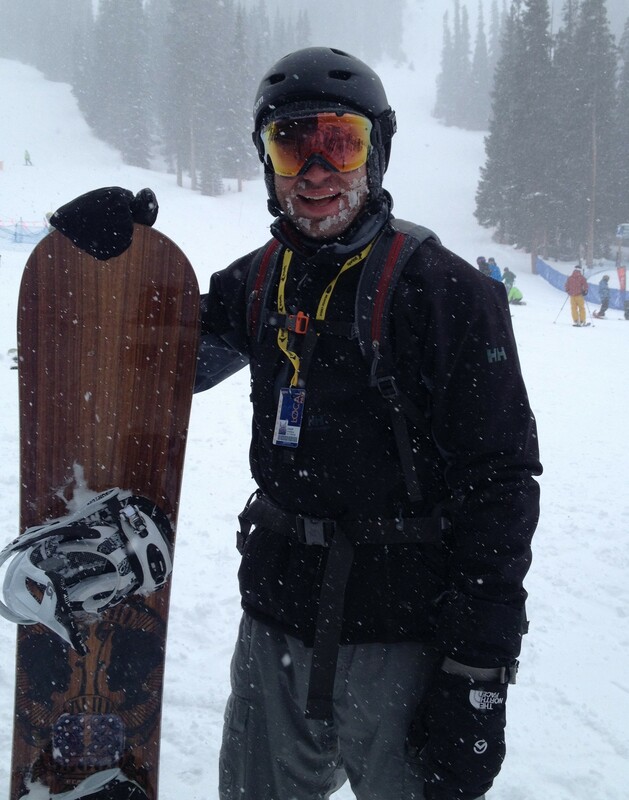 This entry was posted in Eat, Everything Else and tagged a basin, blooday mary, breckenridge, colorado, snow, snowboard. Bookmark the permalink. Woah I don’t know what I would do if I was caught in a white out! Scary! Sounds like you guys had an awesome weekend though! That veggie burger looks delicious! Those eats…yum! They are saying it may snow here tonight…can you believe it? It was just 70 degrees yesterday!! Nuts. haha- thanks! I made Joe do all the driving. It was a little scary at times, but my jeep has 4 wheel drive so we were good. The scariest part was when I was lost in the white out at the top of the mountain!! My hubby almost didn’t make it home from his Colorado trip Sunday because of all the snow! Sounds like it was a crazy storm! I am hoping for no more snow where I am! I always say my spring starts March 1. I have had enough winter! haha- I hated winter when I lived in NYC, but now that I have moved to the mountains of CO, I am loving it!